Don’t have a Mac you can use to file your personal taxes? No problem. If you own an iOS device, it may be all you need to settle up with the taxman. 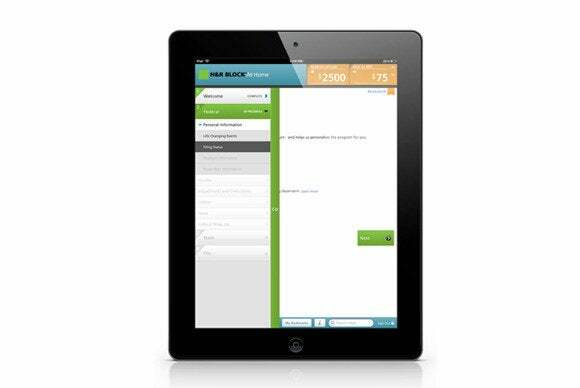 Both H&R Block and Intuit offer apps for the iPad, iPhone or iPod touch that, depending on your needs, will do the job and do it well. If you’re an iPad user, filing taxes on your tablet is no different than filing taxes on your Mac. TurboTax 2013 and the H&R Block app both provide access to all the features of the desktop versions of their related desktop apps, with some subtle differences. 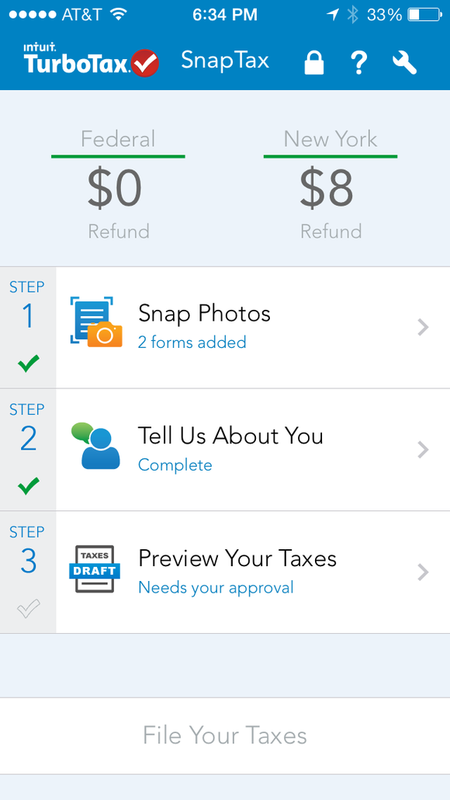 TurboTax is a standalone iOS app, while the H&R Block app connects to H&R Block’s Web-based tax filing tool. 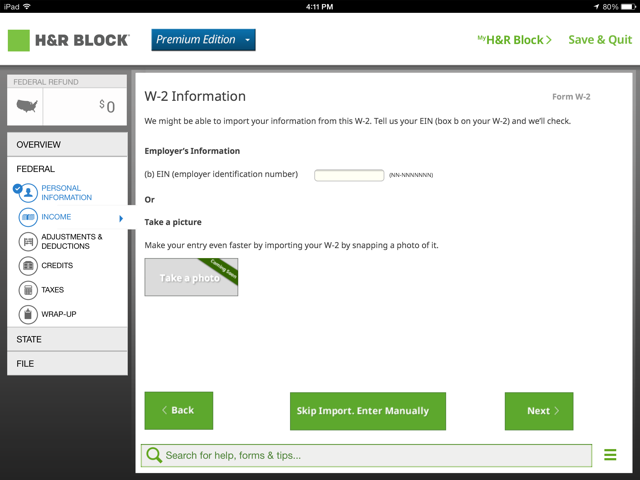 In fact, if you attempt to log into H&R Block’s Web portal while you are using the iPad app or vice versa, you will be automatically logged out of the other app. The upside to this is that you can start something on your iOS device and continue it on your Mac when you get back to your desk. TurboTax for the iPad offers all the same features as the desktop version of the application. The TurboTax app on your iPad is exactly the same as the TurboTax app you purchase for your Mac from the App Store, from the interview process right down to the way you file your taxes. Like the App Store version of TurboTax, downloading the app is free and you only pay when it comes time to file your taxes. 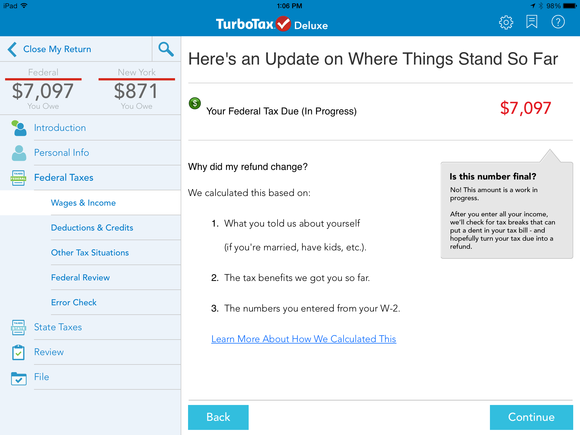 The iPad version offers the option of taking a photo of your W-2, after which TurboTax will attempt to scrape your wage and tax information and automatically enter the data in the appropriate TurboTax fields. While this feature works well, it’s always a good idea to double check the data—especially with W-2s that have many fields filled—as sometimes information ends up in the wrong places. At the time of this review, some features in the H&R Block were not available. For example, you’re supposed to be able to snap a photo of your W-2 so data can be imported automatically, but this tool had a “Coming soon” image in place of the button you’d use to take the photo. The reality is that this isn’t a big deal. If supported by your payroll company, you can easily import your data using your company’s employer ID or enter the data by hand. 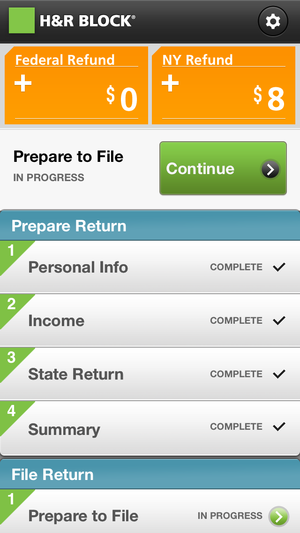 H&R Block's tax app brings isn't really an iOS app as much as it's a portal to the H&R Block web app. Tax apps for your smaller handheld devices are geared toward users who are likely to only file the 1040EZ. H&R Block's 1040EZ app is indeed EZ and offers state tax filing for a fee that's slightly less expensive than the competition. Both the H&R Block 1040EZ and TurboTax’s SnapTax app make quick work of your basic tax filings and they do so in almost exactly the same fashion. After some initial setup you take a picture of your W-2 forms or enter your W-2 data manually, answer a few questions about who you are, what your marital status is, whether you have dependents, and can be claimed on someone else’s tax return. Taking a photo of your W-2 works differently for the two apps and I found that SnapTax worked slightly better than the H&R Block app. This is mainly because SnapTax gives you control over when the image is snapped, while the H&R Block snaps the image as soon as it thinks it detects the edges of the documents. The end result was that SnapTax pulled data from a single shot while the H&R Block app took two or three shots before it captured an image it was able to pull data from. Once you’ve finished entering all your information—a process that takes about 10 to 15 minutes no matter which app you’re using—you can file your taxes. Both apps offer free federal filing but charge for filing your state taxes if you’re in a state that requires you to file. At the time of this review Intuit charged $15 for filing state taxes and H&R Block charged $10. As April 15th approaches, as has been the case for the last couple of years, these filing fees may rise. 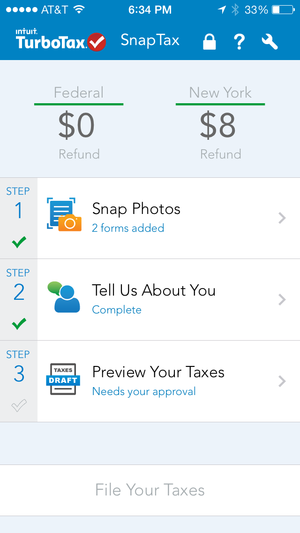 Intuit's SnapTax makes quick work of your 1040EZ but may eat up your state refund with its state filing fee. Another important note: Many people who file their taxes using the 1040EZ form are high school and college students who have small paychecks. They don’t pay federal taxes and have tiny state refunds—the fee to file state taxes may exceed the actual refund you’ll going to receive. For these filers, filling out and sending paper 1040EZ forms may be the better choice. When it comes to filing taxes on your iPad, TurboTax is king. By offering the same features and functionality as the desktop application, it’s guaranteed to help you get your taxes filed on time and without hassle. For EZ filers who file state tax forms, H&R Block 1040 EZ offers a slight advantage as it charges less to file those forms than SnapTax does. Otherwise, either of these two apps will be enough to meet your basic tax filing needs.